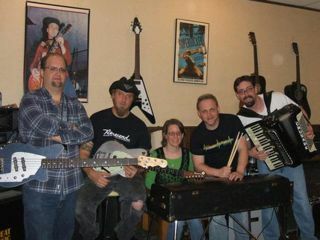 The Toledo, Ohio-based group, who add accordion and an authentic polka shuffle to Pink Floyd classics like Hey You and Another Brick In The Wall, started on a whim. While waiting for bandmates to arrive at a rehearsal a few years ago, guitarist Ken Haas started to amuse himself by playing Comfortably Numb to a polka beat. Hey, it isn't just a living; it's a mission. Want more Polka Floyd? Here's a short clip of their take on Another Brick In The Wall.